I guess this is kind of an obvious prediction, but I think promotional products will become increasingly interactive in the coming year. 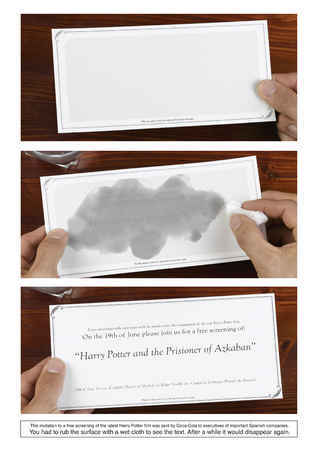 The invite pictured actually appears blank, but when the recipient wets the paper, the message appears, then disappears. Promotional products are basically interactive by definition (they’re things people use or play with), but I think the interaction will become more sophisticated, particularly the interaction with the brand and the message. Like how a Message Pen is versus a regular pen, or a Chalkboard Mug versus a regular mug. And it’s a good thing, because interaction is cool.